In a medium saucepan, heat oil and then add the onion and gently fry for 2 minutes. Add the diced steak, turn up the heat and cook until the steak is seared brown. Add the water and boil for half an hour, then turn down and simmer for another half an hour until steak is tender. Add the gravy granules until a nice thick consistency is achieved. Take off the heat, add half a bottle of Must Chup, season with pepper. Allow the mixture to cool. Whilst the mixture is cooling roll out the short crust pastry to the desired size for the tray being used leaving an extra inch lip hanging over the side. Prick the pastry all over with a fork or blind bake roller. Lightly grease the tray. Place pastry in the tray and leave the overhanging excess. Bake at 200 degrees centigrade for 10 minutes in the middle of the oven. Take out of oven and trim off the excess pastry by running a knife alongside the edges. Allow to cool. 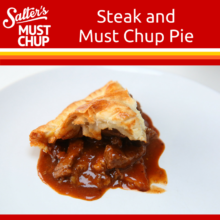 Spread the rest of the Must Chup on the cooled bottom of the pastry, add the steak mixture. Brush the top of the pie with the remaining beaten egg and bake at 200 degrees centigrade for 20 minutes until golden brown. Serve with seasonal vegetables, mash and more gravy. Enjoy!